WAC Landscape Lighting’s Mini Accent includes continuous adjustable beam angles indexed at 10, 25, 40 and 50 degrees. 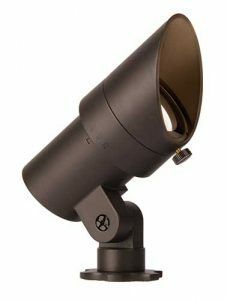 WAC Landscape Lighting unveiled its Landscape Mini Accent, which can be used as an up or down light. The Mini Accent is made of solid die-cast brass or corrosion-resistant aluminum. It operates on a 9-15V system and is available in a 2700K or 3000K color temperature. According to the company, it includes continuous adjustable beam angles indexed at 10, 25, 40 and 50 degrees. In addition, it delivers up to 365 lumens and has a 70,000-hour lifespan. The Mini Accent comes available with two architectural finishes: bronze on aluminum or bronze on brass. Its options include include a 5-in. long shroud, a surface mount flange/stake, a guardian mount, a gutter mount bracket, a tree mount junction box and more. Headquartered in New York, WAC Lighting is a second-generation family owned and operated lighting company.